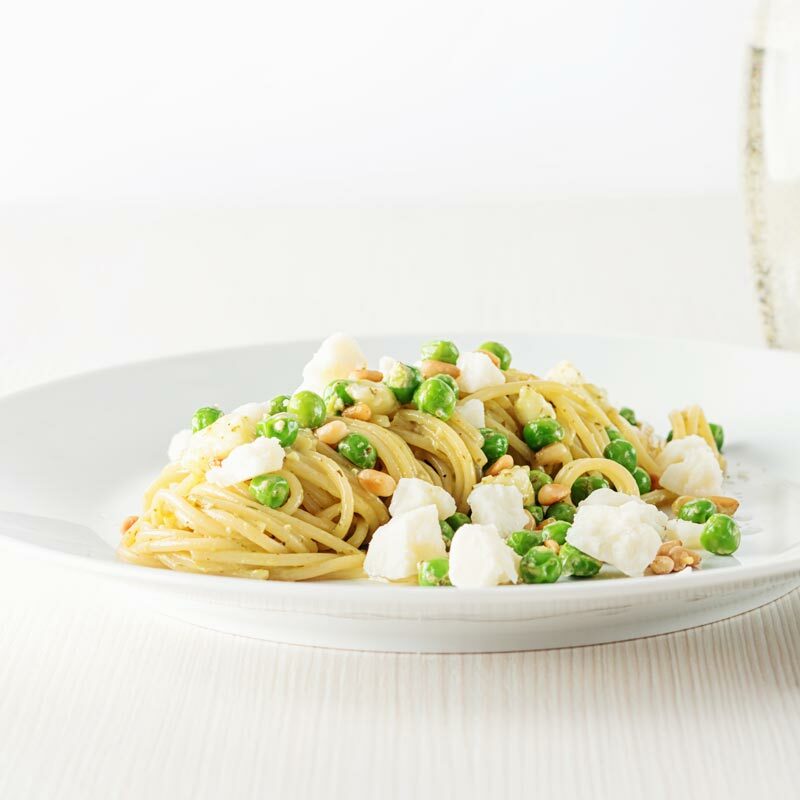 Pesto spaghetti is given a new breath of life with some peas, goats cheese and some extra pine nuts, to make a quick pasta dinner. 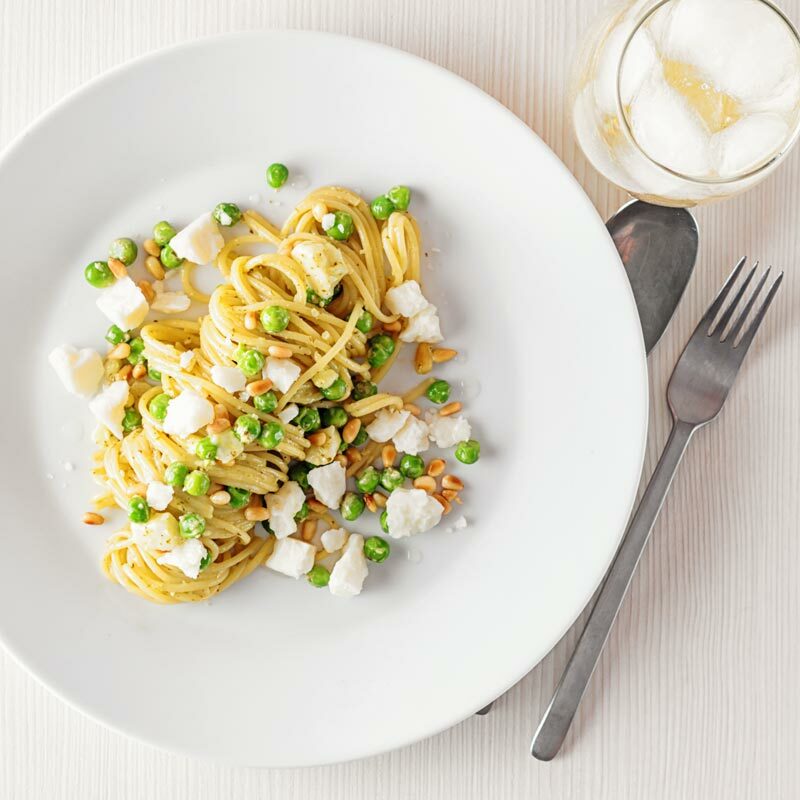 Pesto Spaghetti with Peas and Goats Cheese. Time for the folk who don’t like goats cheese to run away again. This simple Pesto Spaghetti recipe features it in a big way. I love the goat cheese and peas combination. Th acidic salty flavour alongside the sweet explosions of peas is just wonderful as far as I am concerned. It has already appeared as a combination here once this summer in a deep fried goats cheese and pea puree recipe. You really must check that one out, especially if you have someone to impress. It really is a head turner! I reckon the first time I had pesto spaghetti was as a student. It, of course, consisted of pouring a jar of the cheapest pesto I could find into a bowl of the cheapest and probably, most overcooked pasta I could muster. This recipe, however, is much more refined and without question much more tasty than my student fumblings. How to Make Homemade Pesto. I would urge you to make your own pesto it really is superior if you have time. It comes with the bonus of requiring the sum total of zero chefy skills! You toast some nuts after that your cooking is done! You literally then chuck stuff in a mini blender or pestle and mortar and bash or blitz it. Take it to a smooth paste or leave it chunky, it is entirely down to you. So realistically if you can shop you can make a world-class homemade pesto in minutes! Shop bought pesto maybe cheaper, but there is a reason for that… The ingredients in at are not fresh! Can you store homemade pesto? Yup! It will last in the fridge in a jar for 2-3 weeks. All you need to do is cover with a layer of olive oil and seal in a jar. 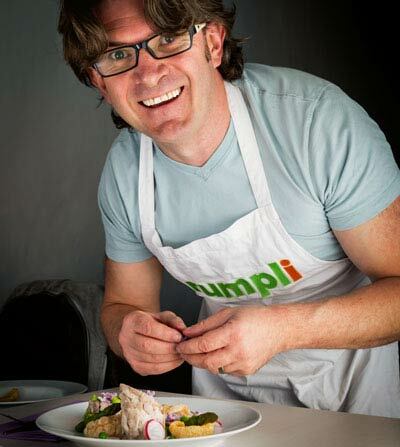 You will find my site littered with goats cheese recipes, I love the stuff. It adds a wonderful salty acidity to recipes that many other kinds of cheese fail to supply. A perfect example of this is in my ham and cheese salad with pickled peaches recipe. But you can also get softer goats cheese that has a similar but lighter flavour that melts wonderfully into a goats cheese risotto or even in stuffed pasta shells! Rather than soft goats cheese this super simple, some would say stupidly simple recipe uses hard matured goats cheese. Hard goats cheese packs even more flavour, I did tell you none goat cheese lovers to run! So what is the difference between hard and soft goats cheese? The principal difference is age. Or more specifically maturity and as with all cheese age adds complexity and flavour. Hard goats cheese is great used in all sorts of dishes. The cheese used in this dish is a cheese matured for a year. This gives it a beautifully complex flavour and crumbly texture. Pasta spaghetti is a super quick pasta recipe, my version adds peas and some aged goats cheese to a classic old recipe. Bring a large pan of water to the boil and generously salt, use this to cook your spaghetti as per the instructions. This should take around 8-10 minutes, once the pasta has been in the water for a couple of minutes heat a dry frying pan over a medium heat and toast of your pine nuts. Keep your eyes on these they will go from not cooked to burned real quick. 2 minutes before the pasta is ready to come out of the pan add your peas and cook for a couple of minutes, reduce this to one minute if using fresh. When you pasta is cooked al dente, drain reserving a little of the cooking liquid. 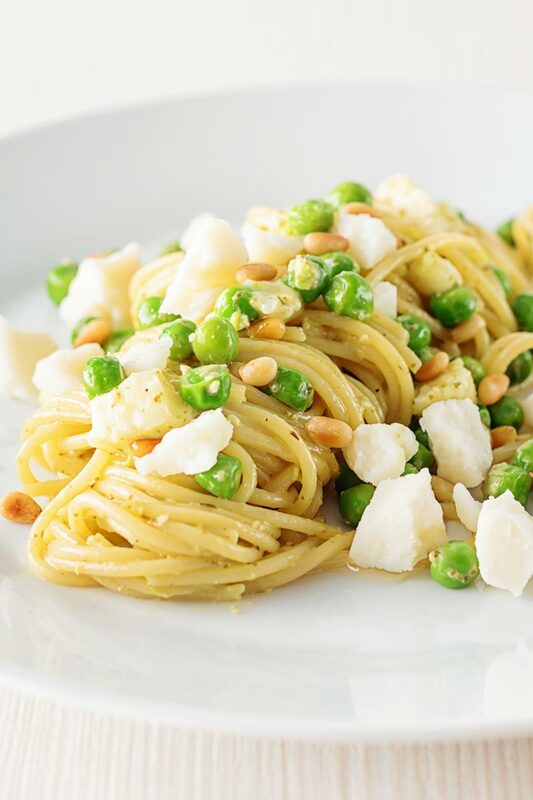 Add the pasta to a pan and mix in the pesto half of the goats cheese, the peas and half of the pine nuts and mix with enough of the cooking liquid to make a nice "sauce". Serve and sprinkle with the remaining goats cheese and pine nuts and drizzle with olive oil. 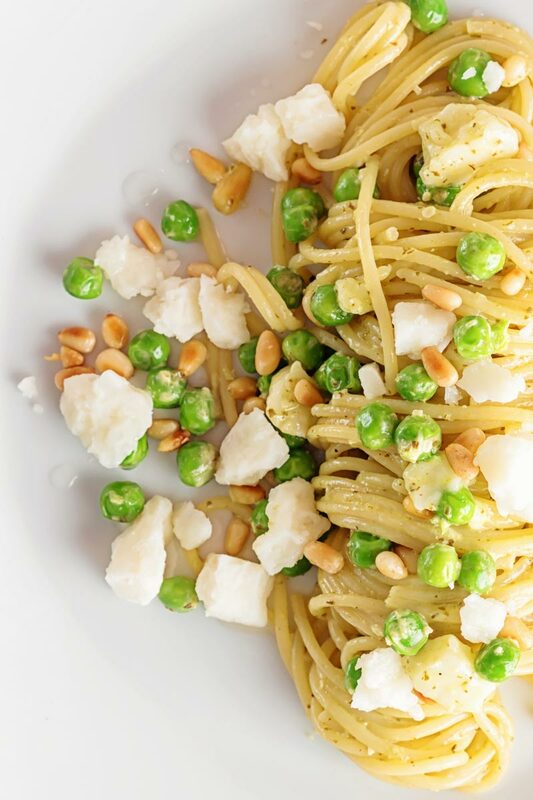 If you are making your own pesto, toast the pine nuts in a dry frying pan. Transfer to a blender, add the remaining ingredients and blitz until an appropriate texture is achieved. 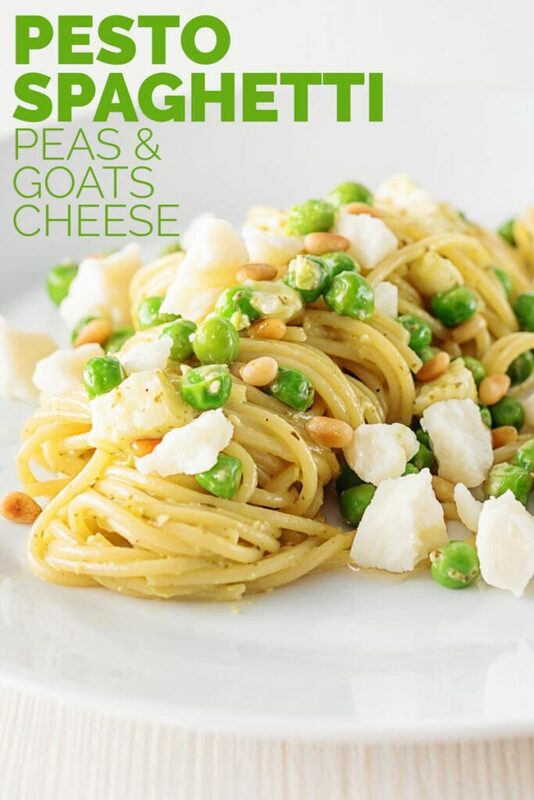 Goats cheese is so tasty and irresistible.your spaghetti with Peas and goats cheese is looking delicious. Thanks Jagruti, this is so simple but really tasty. I adore goats cheese, and I particularly like it with peas, as their sweetness balances so nicely with the goats cheese flavours. Your recipe looks so light, colourful and delicious. It is a combination I have used a couple of times before and one I love! My family would love this Pesto Spaghetti for dinner ! It is so simple to make too! I love pesto and I love how easy this looks! Simple and tasty always good! I hate to say this, I am one of those people running away from this recipe. Hmm hang on, why run away when I could easily replace with a labne. I love everything else about this recipe! Especially the pine nuts, oh heaven. I knew I would find someone who doesn’t like goats cheese 😉 Love the sound of the substitute though! lovely recipe, I am not running away, you will find me anywhere there is cheese. Clever idea combining goat cheese with peas.